That’s me lying in the ditch. It took me a year before I was ready to view this image. Easier now on the eye but still hard on the psyche. The look on Andrew Taylor’s face (centre) says it all about the situation. In the space of a few seconds my great passion for road cycling had left me undone. This post and the two which follow cover my calamitous crash back March 2011 and the story of a recovery which turned out to be different to the one I’d expected. The 5th March 2011. 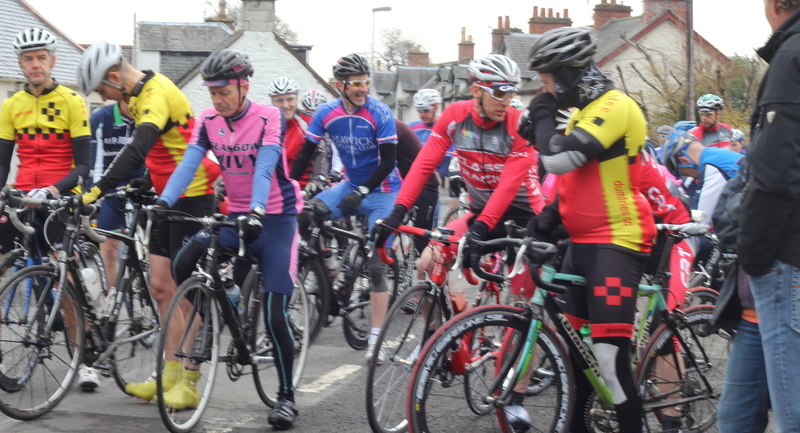 I managed Dumfries Cycling Club’s website and posted routes for our club runs. 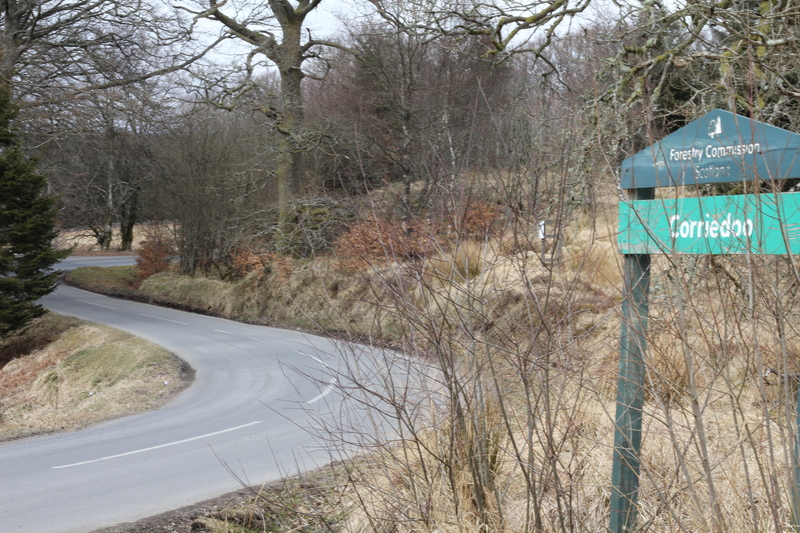 The route for the 5th was a reccy of the Wild Hills course, the premiere race in our cycling calendar. I had had what cyclists call ‘ a good winter.’ I’d worked hard on the turbo, watched my weight and maintained my cross-training with regular running. I was in good shape and confident. Before we started riding, one of the boys mentioned that part of the route covered a road which had been a problem with road works. We decided to press on. Cyclists usually find a way to navigate difficult roads. 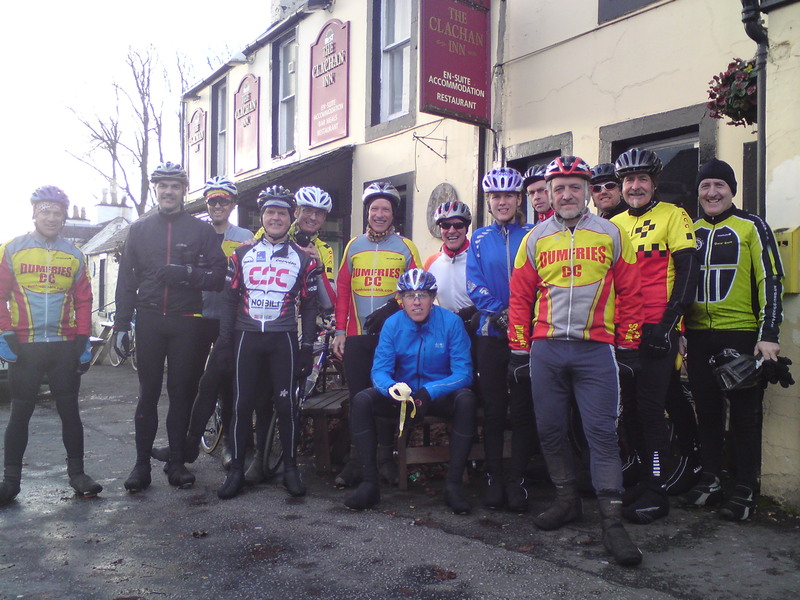 The cycle to Moniaive was the usual winter run mode; some banter, some punctures and regrouping for guys drifting off the back. 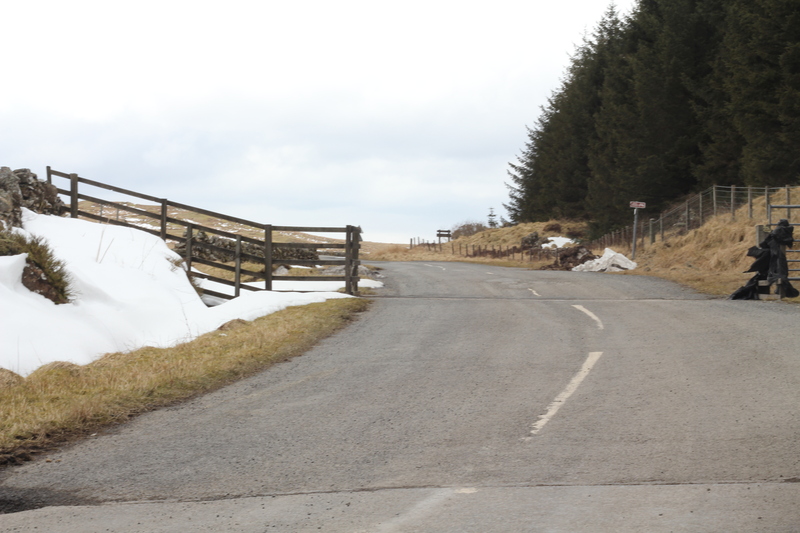 We climbed out of Moniaive (direction Carsphairn) as a group with a couple of guys breaking away up the road, testing their legs after the winter’s hibernation. Cresting the climb the pace picked up for the lengthy descent. I remember being at the back as a large group was shaping into formation. This confidence I spoke of earlier made me power over to them. 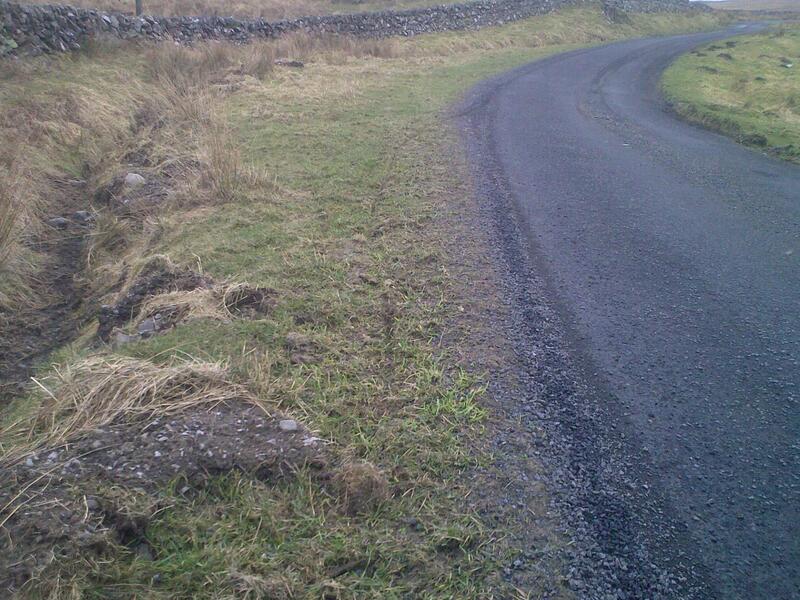 The same confident cyclist saw the road shelled with pot holes, loose grit and debris. Every few seconds a shout came of ‘holes!’ or ‘stones!’ The road narrowed and began to snake left and right. I looked at my computer – 25mph. I caught the verge and started riding along the grass. What should’ve happened was me righting myself back onto the tarmac or at least coming to an embarrassing halt. What actually happened was my front wheel found an irrigation ditch about 2 feet deep. The bike jarred into it and I was catapulted over the bars. So unexpected was this moment that I didn’t bring my arms out to break my fall. My head took the full impact, smashing against a rock in the ditch. I remember hearing the crack of bones and then a bizarre moment: I saw my arms float down beside me in slow motion like snow flakes. I heard shouts as though they were somewhere offstage in a dream I was having. I coughed out blood and broken bits of teeth. Alastair was the first on the scene followed by the other boys. Looking back now I see that they knew how serious it was before I did. I was lying paralysed, asking to be put back on my bike. I needed to stretch my upper back and I’d be fine. They organised an ambulance, spoke to me calmly and discussed the right time to contact my wife. Gradually, very gradually I sensed, lying in that bed of rocks and dirt that something monumental had happened. I tested my feet and toes, moving them slowly. I moved my fingers one by one. They all checked out. 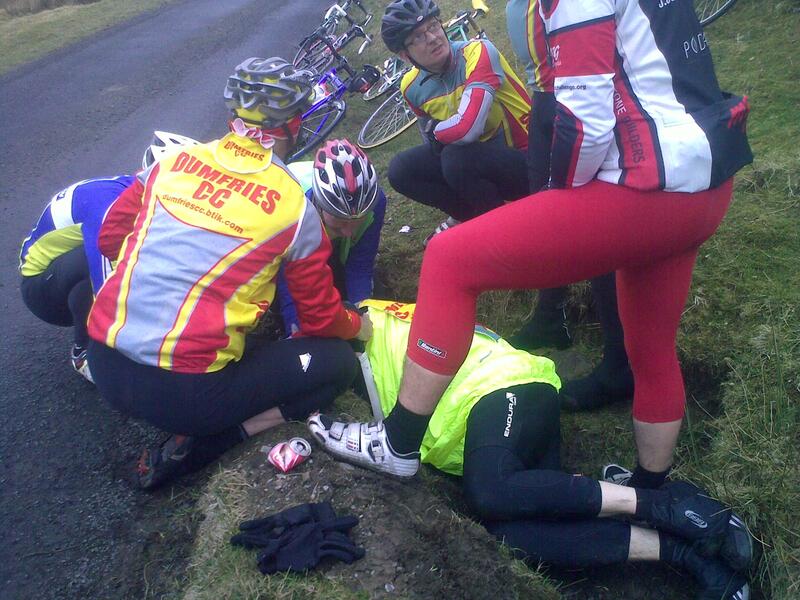 Why couldn’t the confident cyclist raise himself from that muddy hole? I was to find out the next day my upper back and 8 ribs were broken. 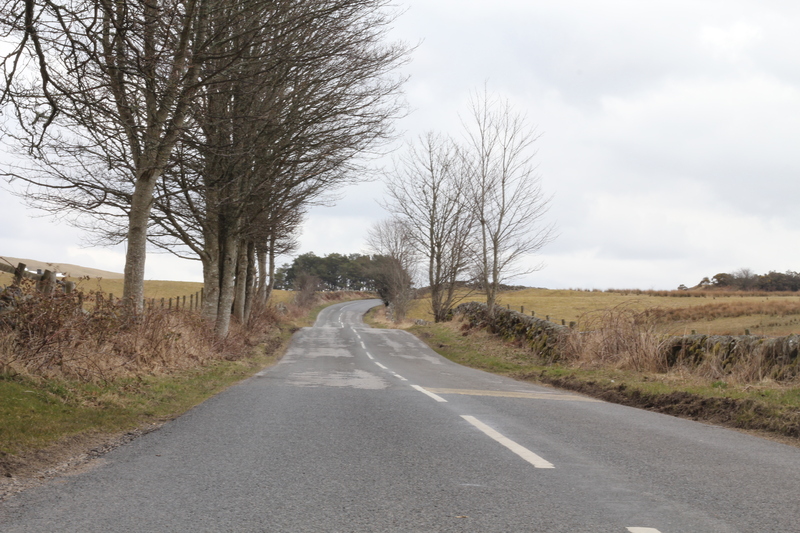 Dave Niblock, a fellow clubman sat by me on the cold moor road and spoke to me quietly, reassuring me as I held his hand. He never asked to be relieved, never looked away, answered everything I asked. It was an act of great generosity on his part that I will never forget. Other guys showed the same spirit speaking to me encouragingly, keeping me conscious, alert and hopeful. I asked if my bike was okay – a pointless but nonetheless typical cyclist’s question. It didn’t have a scratch on it. I lay in that ditch a long time, unable ot move. Everything, the sights and sounds of the natural world was above my eyeline. The world would be out of my view for the next four weeks. Everyone was growing cold. A passing car stopped and offered some old sheets and blankets. Eventually the ambulance arrived. But the road was so bad they said that conveying me in an ambulance would only exacerbate my injuries. They called in an air ambulance. My sense of shame was huge, greater than my injuires at that time. I had spoiled the run for the boys and the medics had come a long way. These men had better things to do. I didn’t want to use a helicopter – keep that for someone who really needed help. My wife and daughter were waiting for me at home. The paramedics offered me some morphine, a drug which would at first befriend then obstruct me in my quest to be ‘normal’ again. After some delicate manoeuvring the air ambulance gathered me up. Strapped in, prone, we took off towards Dumfries Infirmary. Little did I realise then that it would take more than a helicopter to raise me fully from that irrigation ditch on the road to Carsphairn. End of Part 1 (Thanks to John Andrew for the images and for the sensitivity to send them to me only when he knew I’d be ready to look). The thought of cycling 120 miles and more probably sounds gruelling and a litttle crazy…well…it is! The ‘early 20 boys’ – happy times before the chain gang! For some reason I was never keen on racing or time trialling. However long distance cycling appealed to me. When I started on the road bike I thought it was important to get in lots of miles so I could improve my stamina for club runs. As it happened there were a few guys in the club who loved doing long miles. 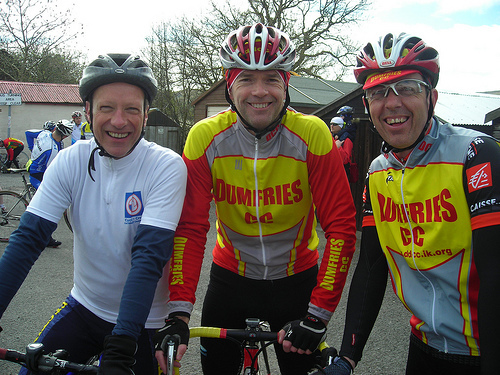 Ian Harkness and Les Kerr had recently completed the legendary Paris Brest Paris Audax – 1200 kilommetres in no longer than 90 hours. Their stories of this event really charged my imagination; man and bike against the elements, falling asleep on their machines, night riding, a fabulous mass start and cheering crowds at the finish. Ian suggested that before our Saturday club runs, we cycled 20 miles to build up my endurance. These early morning loops (sometimes taking in 30 miles) were and still are among my fondest times in cycling. 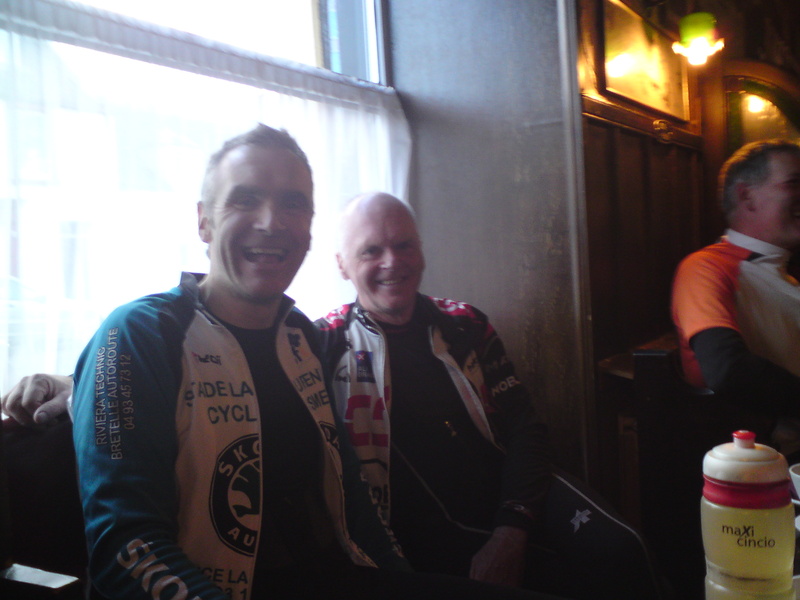 We were joined by Alastair Johnson (another fan of the long miles) and some other cyclists. The joking and general banter filled up the hour of spinning. Then came the main club run giving me a total of cycling of 70 – 80 miles. We’d then sometimes stay out and add on some more miles and follow that with a 10k jog. Ian encouraged me to check out the Audax calendar. Their website was an amazing thing to behold, a long list of long distance events (with jaw dropping distances) all wonderfully titled – The Nyctophobic, Border Castle Randonee and my favourite Etal-U-Can (which I actually completed)! 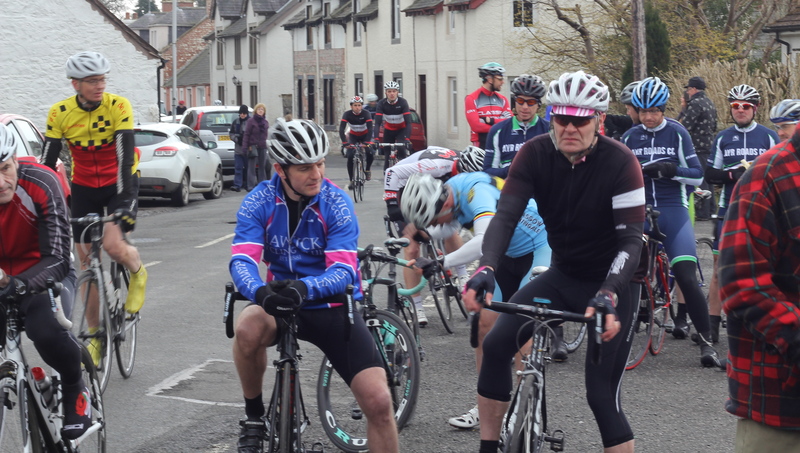 We chose a couple of events starting with a 160 kilometre event up in Strathaven then I graduated up to 200 kilometre rides. Riding an audax is a world in itself. An almost unimaginable range of bikes and recumbents, special little pens, on the road quizzes at key landmarks, collecting receipts, getting stamped at certain distances, cool badges posted to you after the event with your brevet card. I had got myself a second bike, an all purpose Edinburgh Bicycle and Les lent me a good sized saddle bag. Thank god I fitted guards as most of the audaxes I cycled involved lots of rain! But I think my abiding memory of audaxes is cycling through the beautiful Scottish countryside and approaching various towns and the smells of those towns, the bakers mainly! My sister in law has a favourite phrase ‘a bonny looking chooky’ – well on audaxes you definitely meet some bonny looking chookies. I remember one audaxer whom I saw on several events. He was like a dejected Bjorn Borg complete with head band and flowing locks. He never cycled with the bunch but beside us if that’s possible, a rider apart. There was another randonneur who was famed for his spotless bike. I never believed what I had heard until I saw him myself lifting his bike over puddles! Another was a well known audax man perhaps its most famous exponent, George Berwick. He definitely had his own style. He never looked as though he showed up more like he’d just emerged from another long run. A tremendous athlete and cyclist. These audaxes played a huge part in my early cycling life. There was so much to learn. When you’re at mile 80 and you know there’s another 45 miles to go, what do you do? Keep cycling! You learn so much about the psychology of cycling and the determination needed for endurance events. Ian, Alastair and I all felt the gruelling nature of these events but we relied on each other and the guys on the road with us to make it to the end and the food and hospitality at the HQ. Stopping for something to eat was always a pleasure as you got the chance to talk to some of your fellow cyclists and have a good look at their bikes. Lunch needs a bit of thought though. 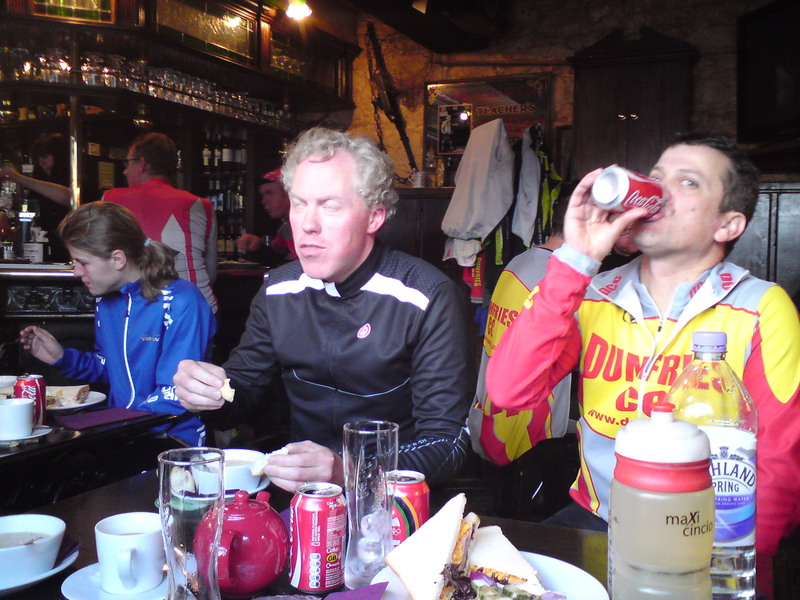 On my first audax we stopped at the Green Cafe in Moniaive. I could’nt resist the carrot cake. 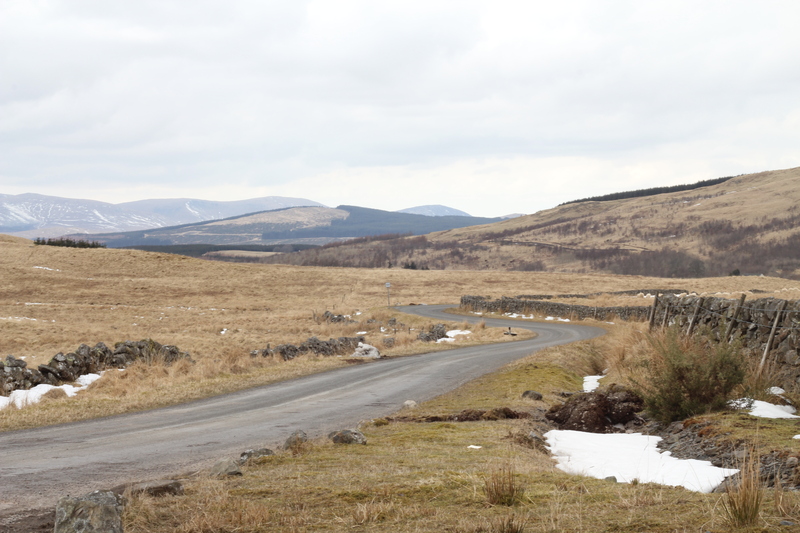 When we re-commenced we had to immediately climb the leg breaking Dunreggan Brae. I remember thinking the Carrot Cake was a bad idea as I searched for my granny ring! 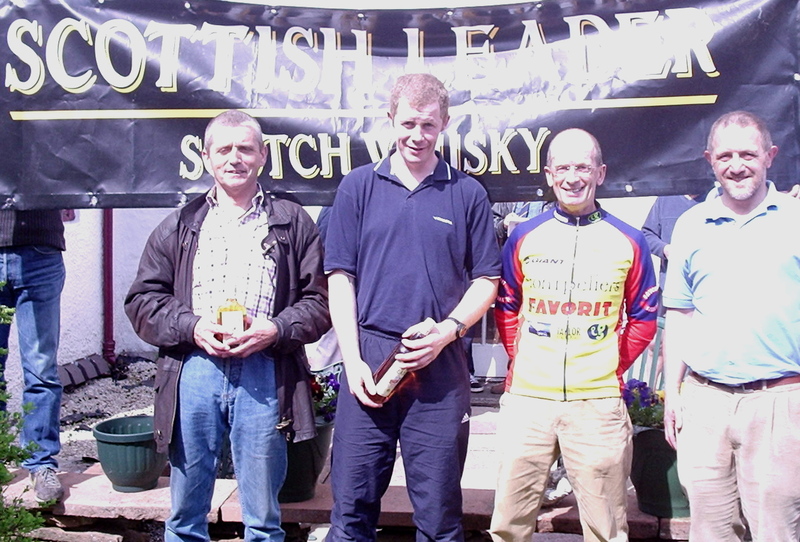 It was one of our club members, John Sturgeon (having himself completed the epic 1400 kilometre Edinburgh-London-Edinburgh with tremendous panache) who first posted on our forum about a new concept, the Sportive, several years ago. He encouraged our club members to try out this new, long distance endurance event. 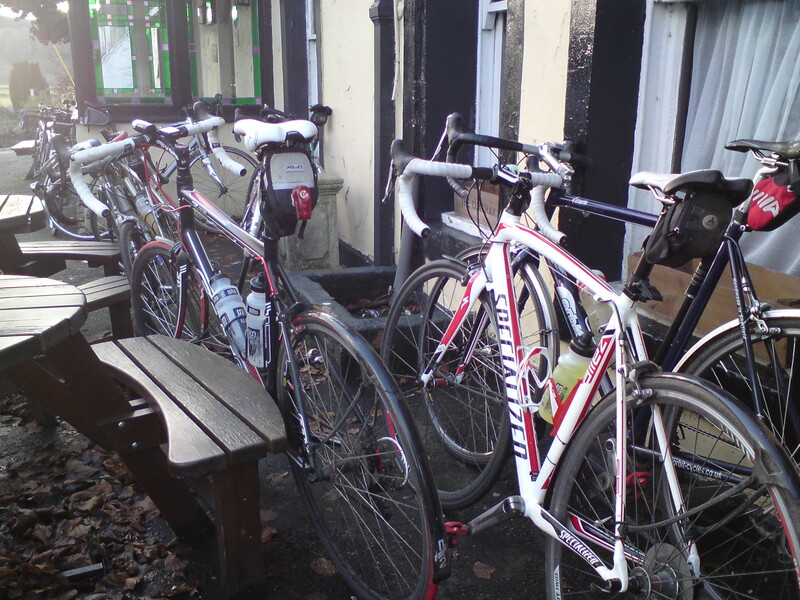 Our club decided to try the nearest Sportive at that time which was over at Brampton. We cycled over for a reconnaissance, doing half the course and then cycling back; 135 miles in total. 130 of those miles were in dry conditions, the last 5 a torrential, Old Testament downpour. That’s long distance cycling for you. 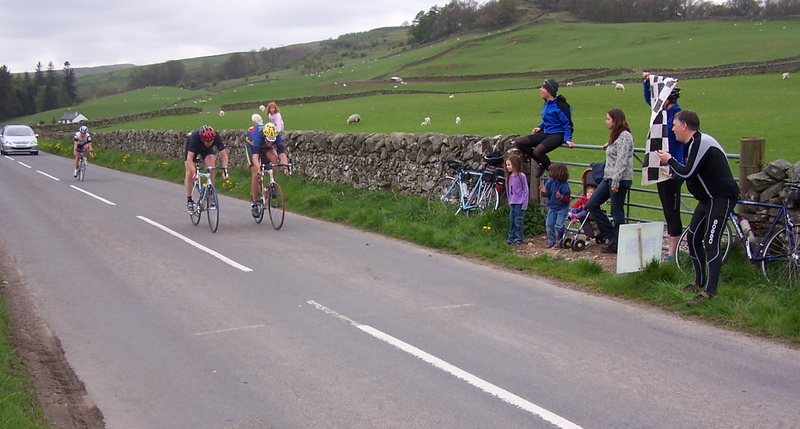 We all gradually gravitated towards Sportives which were tremendous challenges, well organised, competitive and at times brutal and exacting. Despite all this they never had, for me, the idiosyncrasies and the sense of cycling community of the audax. In compiling this post I checked out the Audax site after many years of neglect. 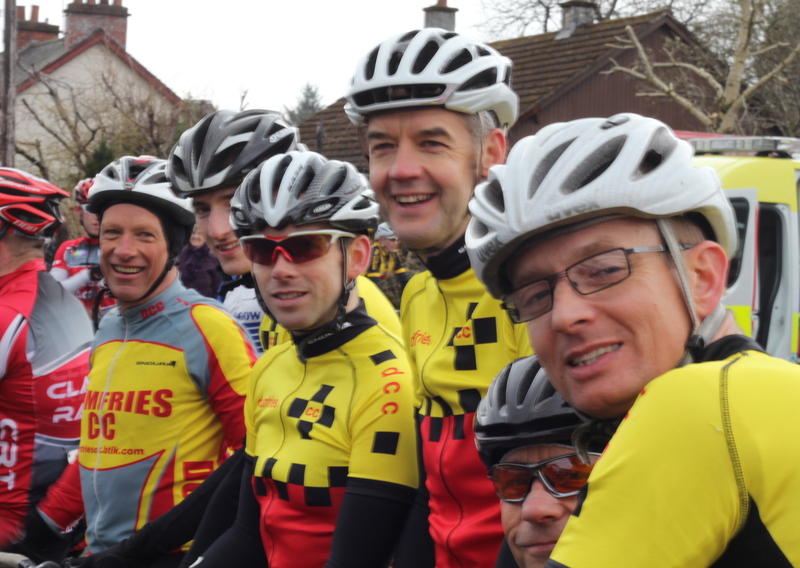 Happily it’s still going strong with wonderful event titles and info for those preparing for the 2015 Paris Brest Paris. Earlier this year my wife and I having waved my daughter off at the airport, were driving down from Kilmarnock to Dumfries. Weaving along the roads the memories of audaxes came back to me. I remembered suddenly those roads round Dalmelington and Cumnock. The minute we were home I text my old audax buddy, Ian…the smells of the bakeries were coming back to me with the rainfall.